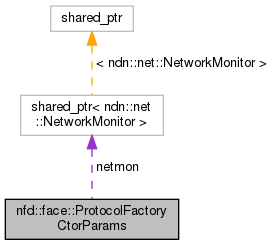 Every ProtocolFactory subclass is expected to have a constructor that accepts CtorParams, which in turn passes it to ProtocolFactory base class constructor. Parameters are passed as a struct rather than individually, so that a future change in list of parameters does not require updates to subclass constructors. Definition at line 46 of file protocol-factory.hpp. Definition at line 48 of file protocol-factory.hpp. Definition at line 49 of file protocol-factory.hpp.